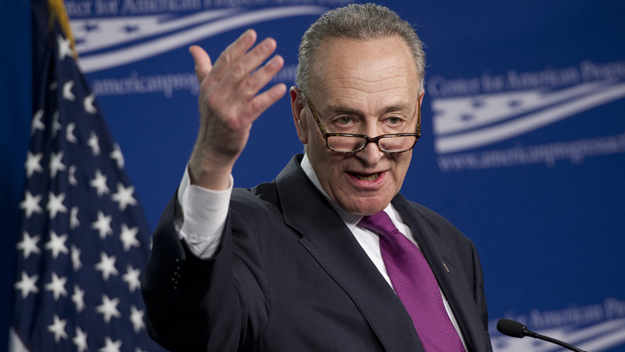 Sen. Chuck Schumer plans to transfer $1 million to the Democratic Senatorial Campaign Committee (DSCC) on Tuesday, according to a report published by Politico. The New York Democrat is donating the money as he tries to help Democrats win back control of the upper chamber and as he seeks to become majority leader. So far in September, Schumer has shifted more than $6 million of the $27 million he has on hand to help Democrats win on Election Day, according to the report. He has also helped raise $800,000 for a joint account for the DSCC and individual candidates, the report said, as well as $2 million for candidates’ committees. The report said Schumer is planning an event in New York before Election Day that a person close to him said could bring in more than $1 million. Right now, Republicans control 54 seats in the Senate, but it appears up for grabs as there are a number of tight Senate races in key battleground states.